John Quinlan was born on February 26, 1970, in Morristown, New Jersey. He enlisted in the U.S. Marine Corps on November 4, 1987, and went on active duty to attend basic training on October 4, 1988. Pvt Quinlan completed basic training at Parris Island, South Carolina, in December 1988, and then attended Basic Avionics Technician training at NAS Millington, Tennessee, from January to July 1989. He next attended F/A-18 Hornet avionics and electronic countermeasures training at NAS Lemoore, California, from July to October 1989, followed by service as an aircraft electronic countermeasures system technician with Marine Aviation Logistics Squadron 32, Marine Aircraft Group 32 of the 2nd Marine Aircraft Wing at MCAS Cherry Point, North Carolina, from October 1989 to March 1993. During this time, Sgt Quinlan deployed aboard the amphibious assault ship USS Nassau (LHA-4) in support of Operation Desert Shield from August 1990 to January 1991, and in support of Operation Desert Storm from January to March 1991. He then transferred to Marine Aviation Logistics Squadron 14, Marine Aircraft Group 14, also of the 2d Marine Aircraft Wing at MCAS Cherry Point from March 1993 to March 1995, and during this time he deployed aboard the amphibious assault ship USS Wasp (LHD-1) in support of Operations Restore Hope and Continue Hope in Somalia from March to July 1993. Sgt Quinlan cross-trained as a C-130 Hercules loadmaster at MCAS Cherry Point from March to August 1995, and then served as a KC-130J airborne radio operator and loadmaster with Marine Transport Squadron 352 (VMR-352), Marine Aircraft Group 11 of the 3d Marine Aircraft Wing at MCAS El Toro, California, from August 1995 until his honorable discharge from the U.S. Marine Corps to join the U.S. Army on September 23, 1997. During this time he deployed with the 11th Marine Expeditionary Unit to Kuwait in support of Operation Vigilant Sentinel in January 1997. He entered the U.S. Army Warrant Officer training program on September 24, 1997, and was commissioned a Warrant Officer on November 26, 1997. WO1 Quinlan next completed Rotary Wing Aviator training, the Aviation Warrant Officer Basic Course, the Electronic Warrant Officer Course, and CH-47D Chinook training in July 1999, followed by service as a CH-47D pilot with B Company, 2nd Battalion of the 52nd Aviation Regiment at Camp Humphreys, South Korea, from July 1999 to July 2000. 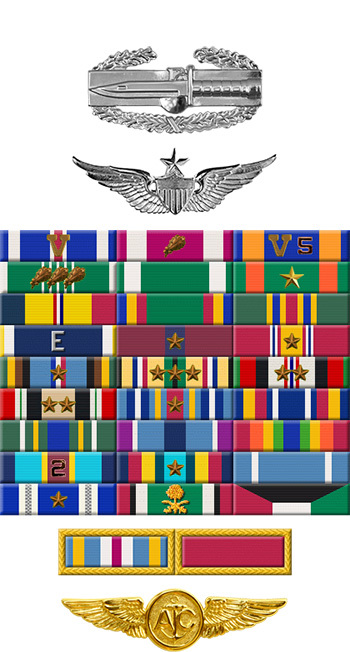 CW3 Quinlan served as a CH-47D pilot and instructor pilot with B Company, 2nd Battalion of the 159th Aviation Regiment at Hunter Army Airfield, Georgia, from August 2000 to February 2004, and then as an MH-47E pilot with B Company, 2nd Battalion of the 160th Special Operations Aviation Regiment at Fort Campbell, Kentucky, from February 2004 until he was killed in a helicopter crash in Afghanistan on February 18, 2007. During the War on Terrorism he had deployed in support of Operation Enduring Freedom in Afghanistan five times, and in support of Operation Iraqi Freedom twice. CW3 Quinlan was buried at Arlington National Cemetery. For gallantry in action while participating in aerial flight as a member of the Coalition Joint Task Force - Mountain, in Bagram, Afghanistan. 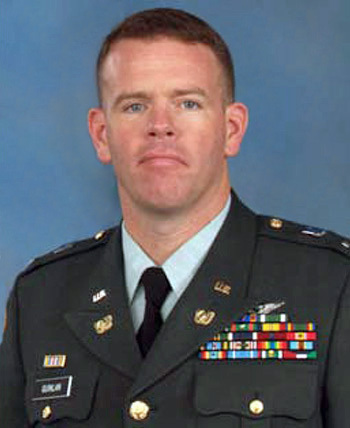 Chief Warrant Officer Quinlan's technical and tactical proficiency, dedication to duty, and commitment to mission accomplishment in a combat zone under the most extreme of circumstances greatly contributed to the success of Operation Enduring Freedom. Chief Warrant Officer Quinlan's performance of duty reflects great credit upon him, the Coalition Task Force - Mountain, and the United States Army.